Mechanicsburg’s Joey Mascadri (2) goes around Triad’s Drew Campbell on the baseline Tuesday at Triad. 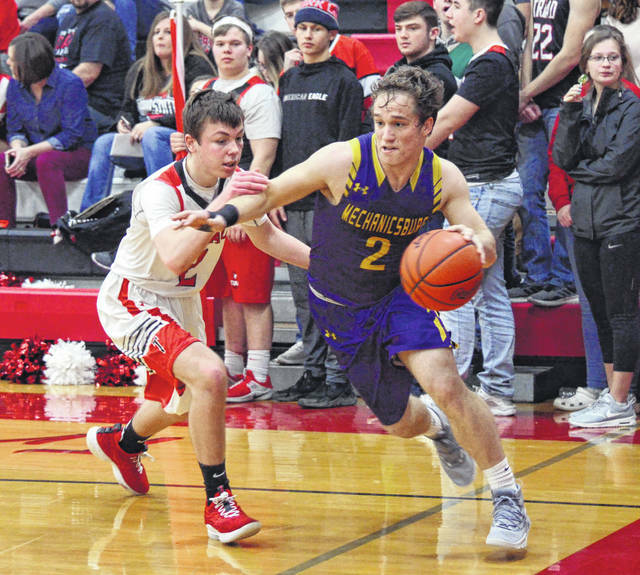 NORTH LEWISBURG – Mechanicsburg defeated Triad, 44-39, in OHC boys basketball on Tuesday. The Indians faced a packed house that was surprisingly loud for both teams, but weathered a good Triad effort early and pulled away late for the win. Mechanicsburg opened with a 10-4 lead after the first quarter, but slipped to a 15-15 tie at intermission when Triad’s Dillon Nott hit a three-pointer as time expired in the half. “I expected this game to be close. Mechanicsburg is a very tough, aggressive team. I told my guys whoever played tougher would probably win. And we both played tough,” THS Coach Jason Malone said. The first part of the third quarter belonged to Triad (0-20, 0-14), which opened up a six-point lead when Nott hit another three and the Cardinals seemingly couldn’t miss. Nott finished with 11 points to pace Triad with Andrew O’Neal adding 8. As the Indians (7-9, 5-8) stayed afloat, Chris Taylor hit a couple of threes and suddenly Mechanicsburg caught fire and regained the lead – for good. Taylor finished with a game-high 17 points – 14 of them in the second half. Logan Hurst added 10 for the Indians. “Both teams played extremely hard and it was a fun environment. Just your typical small-town OHC basketball game. They came in and had a great game plan and made us work. Luckily, we came out on top,” Cantrell said. In the jayvee game, Triad won, 24-19. Tate Campbell scored 7 for Triad while Keith Bebout had 15 for Mechanicsburg. Triad’s freshmen beat Indian Lake, 36-34. Ayden Spriggs scored 17 points for the Cardinals. On Friday, Mechanicsburg plays at Fairbanks while Triad plays at Northeastern. https://www.urbanacitizen.com/wp-content/uploads/sites/36/2019/02/web1_JoeyMascadri020519_ne20192521451443.jpgMechanicsburg’s Joey Mascadri (2) goes around Triad’s Drew Campbell on the baseline Tuesday at Triad.